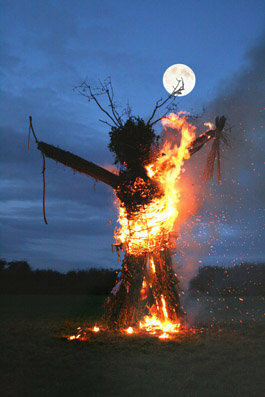 This fantastic picture of a wicker man being burnt under a full moon was taken by Joolz Darling at the Mercian Gathering. As well as this wicker man photo, Joolz sent me other amazing pictures from the event, including a fire eater and a burning labyrinth, which you can look forward to seeing on my Pagan Eye blog posts in the future. Joolz previously sent in a picture of a face in a tree in Swansea. Thanks very much indeed for the lovely photography!